EBS Director Paul Woods was at the record-breaking Dynamics NAV event in Prague. At Directions EMEA 2016 he got the latest news on Microsoft Dynamics 365. Read his blog to understand what it’s all about. You may have heard the term “Dynamics 365” recently and you will certainly hear more about this in the near future as Microsoft moves closer to the product release date. So what exactly is Dynamics 365 and what are the key things to know about the solution? 1. Why did Microsoft choose the name Dynamics 365 and what does it represent? Dynamics 365 is Microsoft’s next generation of business apps in the cloud. These apps bring together the full power of Microsoft across productivity, advanced analytics, Power BI and IoT (‘Internet of Things’), with the strength of Azure and a new application platform and common data model. As such, the new name reflects the significance of the offering and the coming together of the two worlds structured business processes and unstructured personal productivity so our business customers can achieve more. Dynamics 365 and many of these new capabilities, will be available to customers in more than 135 markets and over 40 languages, beginning November 1st 2016. The Enterprise edition of Dynamics 365 will be available worldwide in November of this year. The Business edition will be made available in the same timeframe in the US and Canada with a phased roll out to additional geographies. We will share specific availability and pricing details closer to the release of these apps. Available through Enterprise and Business Editions, to meet the needs of large and SMB organisations, Dynamics 365 will offer subscriptions per app/per user and introduce industry-first plans that embrace the cross-functional way organizations and employees need to work today. There are two editions – Enterprise and Business (SMB). To date, software has been licenced by application – traditionally designed around departmental needs. Our application based licensing supports this traditional model. Role-based licensing is designed to help customers to support their employees and the real world roles they fill. For example, Account Managers do a better job when they can see the latest Customer Service tickets and outstanding invoices. Role-based licensing provides users with full usage rights to PowerApps and Microsoft Flow to compose new apps and easily extend and modify existing ones. Role based licensing improves ROI as companies pay once for access to the capability they need regardless of which application it resides in. This is unique as competitors require customers to buy licenses for multiple different apps – resulting in 2-3x increased cost. 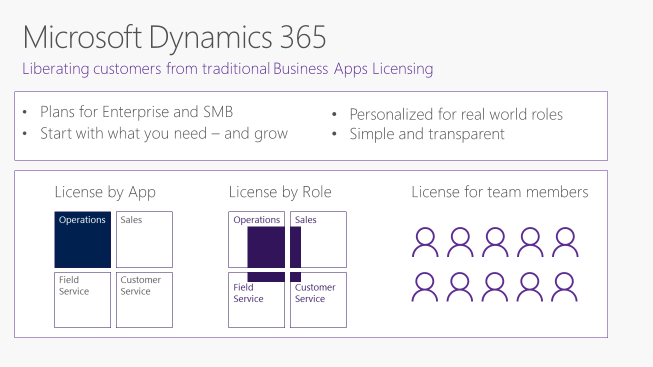 Dynamics 365 licencing is also designed to be inclusive – to meet the needs of employees who may not need to be full users of any business application. On a day-to-day basis, these employees need to book travel, change their personnel information, update a customer record, or review sales data. Dynamics 365 offers a Self Service option to enable these employees to perform these tasks themselves, vs relying on others and impacting productivity. 5. How does Dynamics 365 benefit customers? Dynamics 365 will bring together the best of Microsoft’s CRM and ERP cloud offerings into one cloud service with specific, purpose built, apps for each of your key business processes – like Finance, Sales, Customer Service, etc. Start with what they need by offering apps that fit roles, industries, businesses – so customers can start with what they need and grow at their pace to run their entire business in the cloud. Enable greater productivity where they need it by connecting structured workflow of business applications and processes with the unstructured work of collaboration and productivity so employees are empowered with productivity tools surfaced in the context of their business processes. Be ready for growth through nimble, adaptable applications that allow them to compose, modify and extend processes in real-time. Business users are empowered to change and adapt without IT. And organizations can reimagine their business model with a consistent, flexible, extensible platform. 6. Do all these Dynamics 365 apps really work together seamlessly? All of Microsoft’s intelligent business apps will align to their new common data model, and an extensibility model that combines existing customization tools with PowerApps and Flow. At launch Microsoft will have made solid progress towards apps working seamlessly together, and it’s an effort they will continue as they redefine business processes to eliminate historical boundaries between CRM and ERP. CIS, IOT and PowerBI all play key roles in how they help businesses be more outcome driven and give their customers and our Partner ecosystem the ability to leverage our new common data platform to integrate legacy and 3rd party solutions with Dynamics 365. 7. Will Dynamics 365 be available on-premises? No. Dynamics 365 is a cloud service so it will not be available, as is, on premise or in private clouds. Microsoft will continue to innovate in, and support, our great Dynamics CRM, Dynamics AX, NAV, GP and SL solutions. They will also offer customers connectors if they want to use a hybrid of on-premises and cloud solutions and a migration path when they are ready to move to the cloud. 8. How much will Dynamics 365 cost? The business application industry has traditionally presented customers with a range of siloed applications. When Dynamics 365 launches later this year we want to give customers a new choice. While we’ll support the traditional approach and allow customers to license Dynamics 365 by application (Financials, Operations, Sales, Marketing, etc.) they will also be able to license users by “role.” Our new role based approach will give customers the flexibility they need to support modern, more agile, more diverse employee roles – enabling them to access functionality across all applications within Dynamics 365. We’ll share pricing information closer to availability. 9. What happens to the Dynamics AX, GP, NAV, SL and CRM brand/ products? This is the evolution of our business apps. New versions of Dynamics AX and Dynamics CRM will come together later this year to create the Enterprise edition of Dynamics 365. The Business edition is based on Project Madeira which is in public preview in North America. In the months following general availability of Dynamics 365, we plan to rapidly expand the number of countries where Dynamics 365 for Financials is available. Dynamics NAV, GP, SL continue to be enhanced, supported and licensed to new customers. 10. Why should customers invest in Dynamics products today vs. waiting for Dynamics 365? The core of Dynamics 365 is built upon the proven business processes offered by our existing Microsoft Dynamics applications. Customers investing in Dynamics solutions today get the best solution to run their businesses today and are able to leverage all the power and capability the Microsoft cloud has to offer. When they are ready to move to Dynamics 365, we will have a clear path for them to get to the new offering.